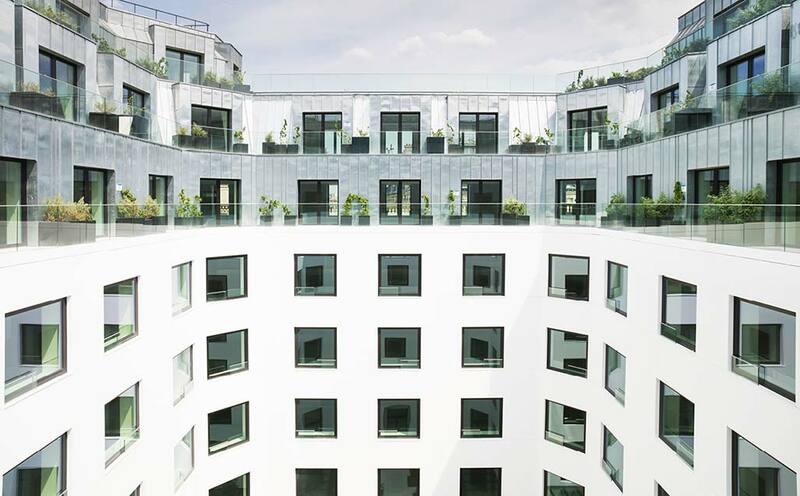 The building constructed in 1929, at 55 de Rue Amsterdam, Paris, enters the 21st century with the renovation carried out by the Naud & Poux agency, which relied on PORCELANOSA Group for its 1,100m2 interior ventilated facade with K-FIX anchorings from Butech and KRION 1100 Snow White as the material selected for the covering. The Naud & Poux studio has been able to maintain the historic essence of Paris, perfectly combining restored historic elements with new, contemporary elements, creating a balanced, attractive combination. Among the contemporary elements is the solid surface KRION. Its resistance to weather conditions, the unnoticeable change of the selected colour (1100 Snow White) of less than 5AE in 10 years, and its recyclable properties, as well as the essential requirement for making a ventilated facade in France, the CSTB certification, make KRION the ideal material for this splendid project. The PORCELANOSA Group company dedicated to technical solutions, Butech, carried out the study and provided technical assistance for this project at the historic centre of Paris.